When my grandson was learning to talk, he said “Sassy” for Jesse. For me, the name stuck. My memories of her are abundant but some things stand out: How she sat on the couch, front feet on the floor and looked back and forth at us as we chatted. When we spoke to her, she’d twist her head from side to side. She was so engaged in our conversation, you’d think she understood our words. Jesse was a happy dog. My son called her a Dr Seuss dog, as she galloped past us, head turning to look at us with a big happy grin and ears flopping. I was always sorry I couldn’t get a picture of what I called her Donovan Bailey look – do you remember the video clip of him winning the Olympic gold, running by at the end of the race, grinning at the camera? That’s how she looked. 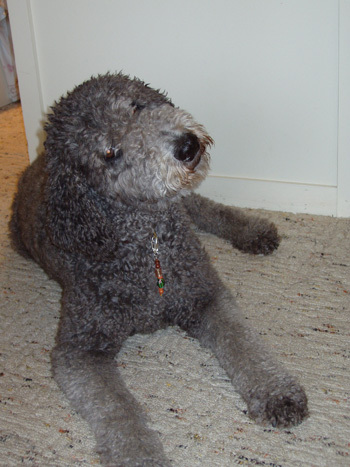 She was a sweet, gracious, good-natured dog who loved water puddles and snacks. 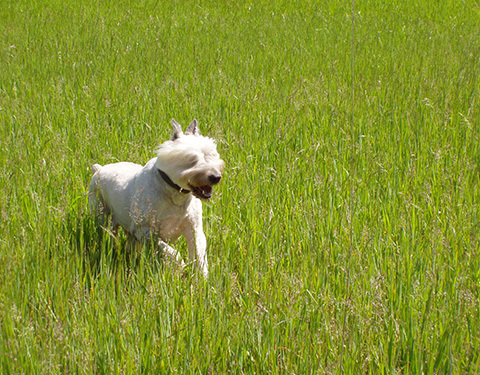 This picture, taken in 2007 when she was nine years old is a testament to her joyful being. We love our memories of you, Bougie. Sleep well, sweet girl. June 22, 1996 - July 1, 2012 Nicholas left us on Canada Day, July 1, 2012. He was a most curious dog. He'd scope out all incoming parcels and was always up for an excursion. Nick would hear me in the bedroom and come to the door to silently watch me as I put on makeup. He knew. I was going somewhere. But was he? I took him as often as I could because I couldn't bear his disappointment. If I said, "Ok, you're coming", he’d pounce on his pillow, shake it vigorously, run to tell Jesse by grabbing her by the neck and then scoot back and forth from room to room. On the other hand, if I said "You have to stay", his whole body slumped and he went to his bed. I'm sad thinking about that now. Nicholas was prey driven - a bloodless pursuit as he always exuberantly announced his intent. Nick had the most difficulty getting around but was always up for a walk, leaving the other two watching us go, content to lie on the hill or the end of the driveway till we got back. When Nick would spot someone at the forest entrance, especially if they had a dog, he'd puff up and prance and for awhile would look young again. I'll probably add to this later but for now I'll just say, "I love my boy. You were a very good dog." Nicholas, age nine. (I tried to remove the red eye. 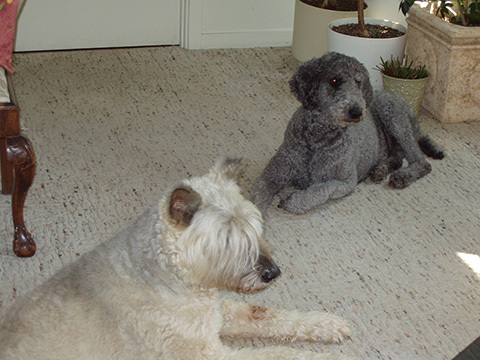 Lucy, below, was Jesse and Nicholas's friend and a sweet, wonderful dog. 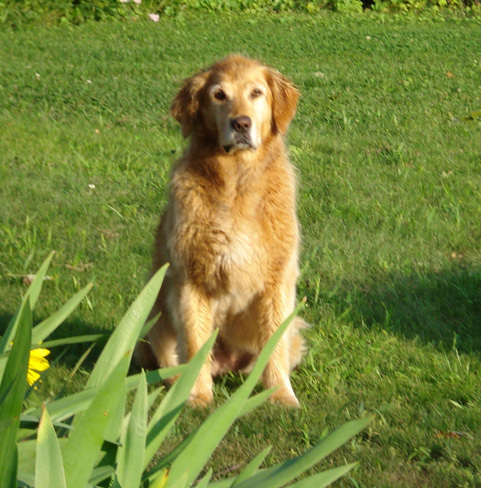 Our beautiful golden retriever Lucy died peacefully today, surrounded by her family. She had a wonderful 14 years full of all the things dogs love to do. Running through fields and forests, swimming, chasing small critters, visiting with the neighbours, overseeing all activities around the farm and helping herself to fresh veggies and berries from the garden to mention a few. 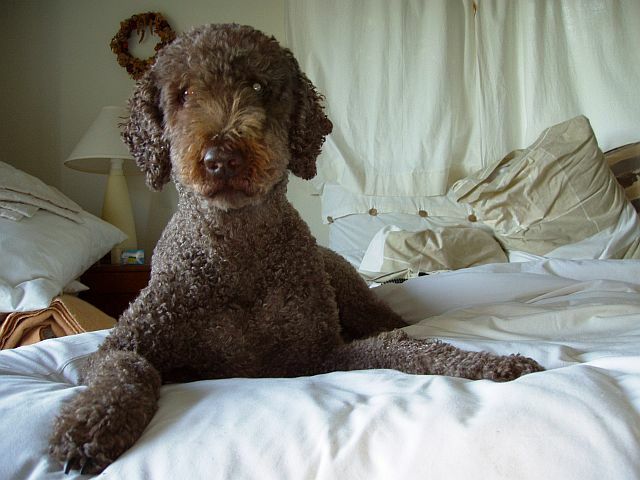 A loyal friend, constant companion, brave protector and beloved member of the family, she has left big paws to be filled. She will be greatly missed.